ZenMate is recommended for users who primarily want to stream and unblock sites like Netflix. However, if you’re worried about privacy – in particular DNS leaks – or overall speed, then you may need to look elsewhere. ZenMate was developed and is currently based in Germany. One of the main things to be concerned about here is mass surveillance and cooperation with US intelligence agencies. However, since ZenMate claims to keep no logs of user behavior or website connections, this should not be an issue. When it comes to functionality, it’s no surprise that ZenMate has over 40 million users. It is definitely geared towards beginner VPN users and provides an extremely user-friendly interface. Ultimately, it is most suited to those who want to unblock streaming sites and enjoy fast connections for private browsing. With a 14-day money back guarantee, you’ll have ample time to test it out to see if it’s a good fit for your needs. While ZenMate’s literature talks about a free version, this actually only refers to the browser extensions, which aren’t really VPNs, but rather HTTPS proxies. If you do decide to go this route, which isn’t recommended, you’re limited to servers in Germany, Romania, Hong Kong, and the US. 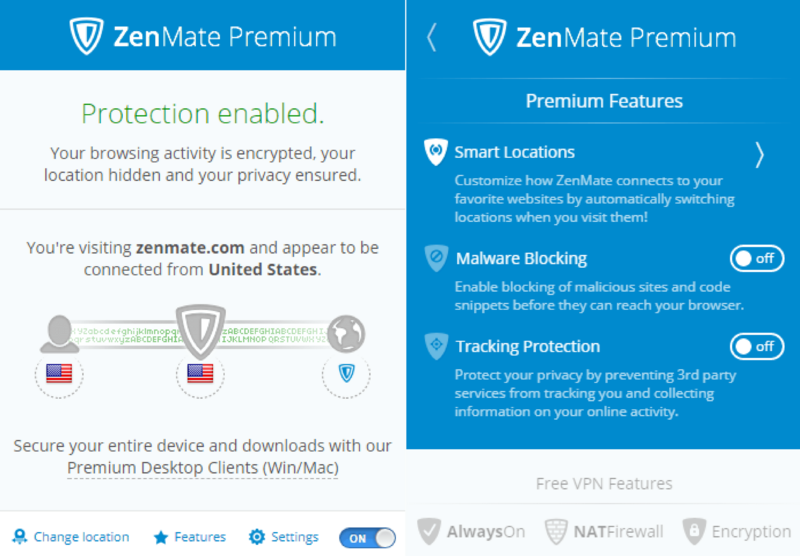 Plus, ZenMate doesn’t claim to be able to provide high-speed connections with its no-cost version, so if you’re looking for a reliable free browser extension, you may need to look elsewhere. For the purposes of this review, we’re using the Premium VPN service, which includes desktop and mobile apps as well as premium versions of the browser extensions. You can try this out for seven days for free without having to provide any payment information. Just a heads up if you do go for this trial, your confirmation email may end up in your junk mail, so check for it there. Once the trial is over, the Premium subscription will set you back $6.99 (GBP £5.15) per month for an annual subscription, for use with up to five devices simultaneously. This price has increased quite significantly since last year and this provider is now fairly expensive. For shorter terms, the price rises again to $9.99 (GBP £7.66) per month for six months and $12.99 (GBP £9.96) per month on a monthly basis. Deal alert: Zenmate is currently running a promotion offering reduced rates, three months free, and a 30-day money-back guarantee. The plans listed below are the standard, non-promotional prices. Apps are available for Windows, MacOS, Android, and iOS. Browser extensions can be downloaded for Chrome, Firefox, and Opera. Payment options include most major credit cards, PayPal, and UnionPay. ZenMate doesn’t currently accept bitcoin. All apps enable you to easily choose your server’s country location. 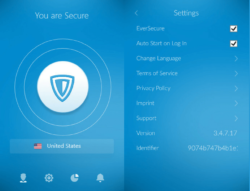 They also include several default features, including EverSecure. This forces the VPN to connect every time you connect to the internet. Within the desktop app, there’s also the option to Auto Start on Log In to save a little time. Security features include a kill switch and DNS leak protection. If you download a browser extension or use the mobile app, you’ll have access to additional features. These include the handy Smart Locations function (more on that below), malware blocking, and tracking protection. Torrenting isn’t explicitly promoted by ZenMate, but given its unlimited bandwidth and decent speeds when you’re using a geographically close server (see the performance section below), it shouldn’t be too difficult in many cases. However, there are VPNs out there that are more suitable for this purpose. Getting started with ZenMate is super simple. Whether it’s a good thing or not, there aren’t a ton of options, so beginners will easily navigate the interface. Once you’re signed up, you simply install the appropriate version for your operating system and log into your account. For this review, we tested the apps for Windows 10, Chrome, and iOS. When you launch the desktop version, the dashboard will appear in the bottom right of the screen. Once you start using another application, the dashboard will return to your tray. You’ll then have to click on the tray and the ZenMate icon to make it reappear. If you’d prefer to access it with one click, you can simply pin it to the taskbar. You can perform a couple of functions from the tray without pulling up the dashboard. Just right click the icon and you can opt to disconnect or change the server location. Within the main screen of the dashboard, you’ll see whether you are secure or not, and which country’s server you are connected to. Then there are four main options. In the first, you can view your account settings (including upgrade options) and edit your account. Within the Settings tab, you can enable EverSecure and Run Zenmate on startup. New additions to this screen include options for enabling the kill switch, DNS leak protection, and locations monitoring. Here, you can also change the language and navigate to support. Next is the Statistics screen, which shows you your connection time and download and upload traffic. Finally, you have the Notifications screen. 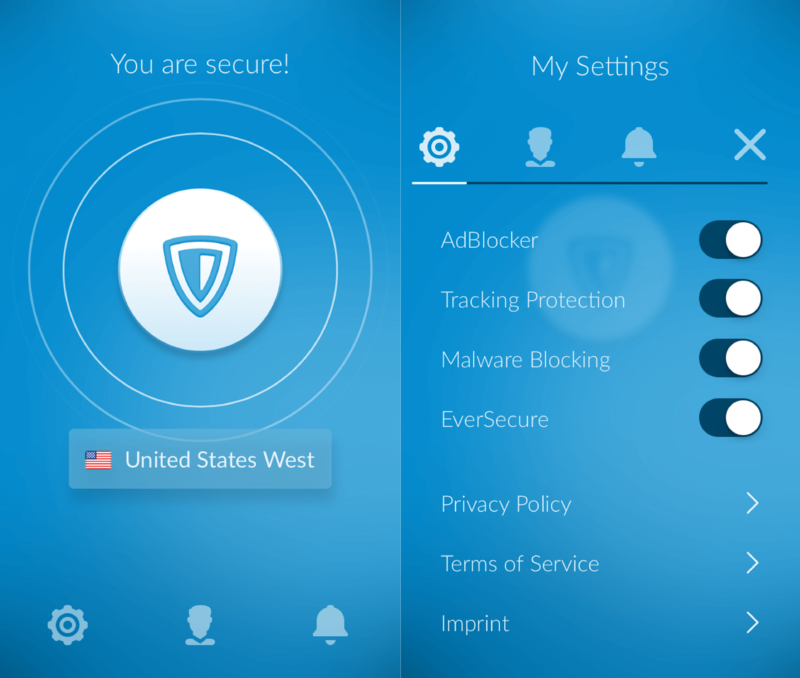 In the Features tab, you can enable Smart Locations, Malware Blocking, and Tracking Protection. Smart Locations is a handy and easy-to-use tool that enables you to automatically switch servers depending on the website you’re visiting. For example, if you tend to watch a lot of US Netflix, but want to be able to easily switch to streaming BBC iPlayer from the UK, you can set it up to switch servers automatically. Over in the Settings tab, you can change your language, enable SmartPrice (a shopping feature), and enable WebRTC protection. The mobile app looks very similar to the desktop version, with a few different options. The main omission here is the Statistics screen, which probably isn’t a big deal for most users. There are, however, additional options in the settings screen including AdBlocker, Tracking Protection, and Malware Blocking. Overall, the app is super simple and very intuitive. This does have something to do with the fact that there are very few options available, which might be a disappointment to some users. However, if you’re a beginner, you’ll probably rejoice at its simplicity. ZenMate has over 1,000 servers in 30 countries. This is a solid number for a provider of this size, and it claims to be continually adding more. Unfortunately, you don’t get information about individual servers and are simply connected to whichever one ZenMate decides for your choice of country. Streaming 1080p video was seamless, and there was no buffering while connected to various servers in the US and Europe from the test location in Canada. There was also no noticeable lag when playing online games using similar server locations. Connecting to various servers seemed particularly fast and never took more than a few seconds. The connection didn’t drop while surfing, although there were a couple of instances when it dropped while downloading a file. This happened once during our speed tests, and again when downloading a larger game file. Connecting to a UK server seemed to have a noticeable effect on general browsing. For our speed tests, in order to be as empirical as possible, we downloaded the same file (266MB) from a Chicago server. We did this using three sample VPN servers at three times during the day. The results were compared to those of two other VPNs (CyberGhost and PrivateVPN), which were tested in the same way. We benchmarked these results against a control test using no VPN. The tests were conducted from Toronto, Canada using servers in the US and the UK. In the boxplots below, the thick black line represents the median download time, while the red diamond represents the mean. Lower is better. The ZenMate results were generally pretty good for US servers, which were presumably geographically close to the test location. However, the US West results were inconsistent, and the UK test times were consistently slow. The latter significantly brought down the average speed, such that it was several times slower than that of the control tests. The size of the box in the chart above is an indicator of the vast spread in the results. In general, it appears that the consistency and speed of this provider diminishes quickly as you start to use servers that are further away. Although, it’s important to bear in mind that these tests can’t be considered definitive and simply provide a general indication of what you might observe in practice. The inherent volatility of the internet adds a significant factor of randomness, so tests such as these need to be taken with a grain of salt. They were run on a 30 Mbps connection, so those with slower connections will endure longer wait times and potentially smaller or larger discrepancies. ZenMate appears to be one of few VPNs that still work with Netflix. It worked seamlessly when connected to US and US West servers. We tried with a UK server, but couldn’t access the Netflix site. Tests with Japan and France servers delivered proxy errors. Similar observations were made on both the desktop and mobile versions. It is becoming more work for providers to keep up with offering Netflix access as the streaming company cracks down on the use of VPNs to access it content. It seems that many providers are focusing on US Netflix because it has the largest library and is in high demand from users. We tested other sites with mixed results. We were unable to unblock Amazon Prime Video, but a UK connection enabled access to BBC iPlayer, ITV Hub, and All 4. Does ZenMate work in China? While ZenMate may work for some users in China, the company doesn’t claim that it will. They actually advise against purchasing a premium account in China – and a couple of other countries – even if you’re able to download it. On the other hand, if you’re looking to unblock content in other specific countries, you can check ZenMate’s dedicated support page to see where it claims the VPN is working. When it comes to data security, this provider uses 256-bit AES encryption, whereas it used to use 128-bit. While both are considered extremely secure, 256-bit is deemed to be more so. This is used in conjunction with 2048-bit RSA keys and SHA256 for authentication. EverSecure is enabled by default, so a connection is forced every time you connect to the internet. You can easily switch this off at any time within the Settings screen. There is a built-in kill switch and DNS leak protection, both of which are disabled by default. When we tested ZenMate for DNS leaks last year, we observed leaks with a couple of test servers. However, with new testing, it appears any issues have been addressed, as no leaks were observed. ZenMate uses Google DNS servers which isn’t ideal for privacy since Google can track which websites you visit through the VPN, although it won’t be able to view your real IP address. ZenMate’s support pages include plenty of FAQs and troubleshooting documentation. It doesn’t offer live chat support which many users will miss. You can submit an email request by selecting Contact ZenMate Support. The support is provided by Zendesk so it’s not done in-house, which may raise privacy concerns for some. When we submitted a request, we got an automated message saying that we’d receive a response in 48 hours which is pretty average for an email ticket. However, the response we got the next day was from a bot which didn’t answer our questions. Given the option to escalate to human support, we did, and received a knowledgeable response within a few hours. While this was okay, it was a bit of a lengthy process to find answers to some simple questions. Overall, ZenMate offered a mostly fast and reliable connection. While its speed test results were inconsistent, if you’re able to stick with geographically close servers, you shouldn’t see too much of an issue with surfing, streaming, and perhaps torrenting. Moreover, if you’re looking to unblock Netflix and other blocked streaming sites, then you should be in luck. ZenMate isn’t the most suitable option if you’re looking to unblock basic websites in countries like China or the UAE. And if you’re looking for prompt support including a live chat service, you’ll need to look elsewhere. VPNibVPN review 2019: Does this small provider measure up? VPNCyberGhost Review 2019 – Is buying this low cost VPN money well spent?